March 20, 2009 - Pavlou M.(ed.) authors: Pavlou M.-Parsanoglou D. - Djordjevic O.
. Lack of awareness or downplaying of racism in sport. The most characteristic aspects of the situation with respect to racism and discrimination are the low level of awareness, the minimisation and downplaying or pure ignorance of the problem. Racism is often debated in the public sphere, especially in printed media. 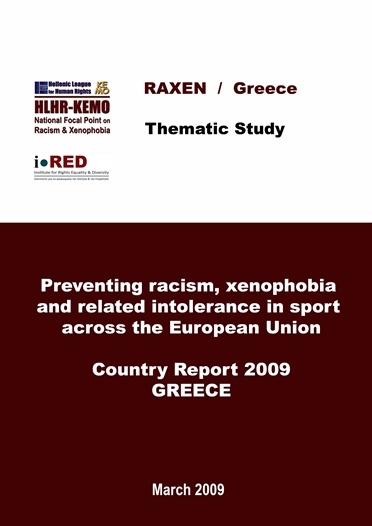 Paradoxically however, media publications mainly refer to racism in football in other European countries. Greece is considered to be immune to such phenomena and certainly not suffering from them like other countries.
. Negative public attitudes towards migrants and minorities. All types of discrimination are perceived as widespread. This is especially true for discrimination on the basis of ethnic origin.
. Inefficient anti-discrimination policies. There is no racist crime, recognised as such, related to sport. This is a direct consequence of the fact that no violent incident has ever been prosecuted as such or judged as such by any court. Among the very few discrimination cases reaching the only efficiently operating equality body within the field of the anti-discrimination law - the Greek Ombudsman - none concerns discrimination in sport.
. Migration and citizenship policies’ shortcomings. Legislation regarding migration and integration of immigrants suffers shortcomings in allowing a functional residence permit system and in promoting and guaranteeing equal participation and integration of long-term residing migrants. There is no specific path towards naturalisation/citizenship for second and third generation of immigrants.
. The absence of any statistical information is attributed to the absence of recording and recognising racist violence incidents as such, which echoes the police culture reluctant to investigate and prosecute racist crime.
. Common types of racist incident are one, verbal insults or mocking and banners against athletes and/or fans on the basis of either ethnic or racial origin, and two, verbal and physical violent attacks on specific ethnic groups of fans triggered by sport events involving foreign athletes and/or teams.
. The most affected by racist violence are third country nationals of neighbouring countries, such as Albania and Turkey. 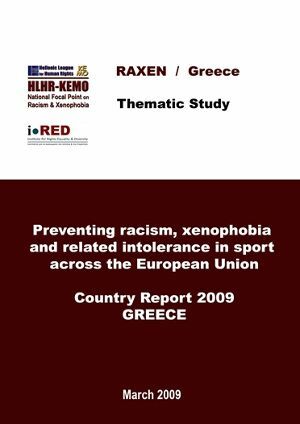 African or Afro-Greek athletes and fans are also frequently subject to verbal violence and insults for their racial origin and the colour of their skin.
. Extreme right wing groups, present inside and outside the stadiums have used sport, in particular football, in order to reach out to and recruit young people and wider public on the basis of commonly accepted nationalist and/or ethnocentric rhetoric schemes and discourses. This is true especially since the late 1990s. Their major presence has been recorded during the years of successful international presence of the Greek national football team. Their effort was to build and promote their ideological views on the widespread national euphoria.
. Common form of structural discrimination in all sports is the disproportionate under-representation of migrants and minorities in all sports.
. In all three major sports participation of foreign nationals as athletes is forbidden at amateur level, or subject to extremely restrictive rules.
. There are de jure and de facto limitations to participate because of the fear of victimisation, and on the basis of sport regulations and restrictions that aim at promoting athletes of Greek origin.
. There are no specific national regulations preventing racism and xenophobia in sports. The general anti-discrimination legislation is applicable, although no relevant case has ever been handled by a court or an Equality Body. The inefficiency and lack of independence of competent Equality Bodies are also reflected in sport.
. The only specific anti-racist rules and sanctions are provided by the Football Federation¡¦s Disciplinary Code, recently amended in order to comply with FIFA regulations. However, the Greek Federation chose not to fully harmonise its regulations as suggested by FIFA. It also included alleviating clauses allowing the effective non imposition of fines under exonerative circumstances.
. Regarding the very few examples of good practices, they are sporadic (usually one-off events), unsustainable and celebratory in character. They hardly meet any of the criteria used to define a good practice.